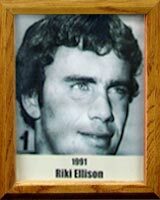 Riki participated in football, track, wrestling and basketball while attending Amphitheater High School in Tucson (1975-77). “Gray,” as he was known by his teammates, played on the state championship football team in 1975; was All-State in 1976-77; and was All-American in 1977. That same year, he was named Arizona Player of the Year in football, track and field and wrestling. Riki attended the University of Southern California where he started as linebacker for four seasons. His team won the National Championship in 1978 and were Rose Bowl Champions (1979-80). Riki was named Freshman All-American in 1978; All PAC-10 in 1980; and was chosen Defensive Player of the Year in 1982. Donning a pro uniform in 1983, Riki was named to the All-Rookie Team in his first year and went on to become a standout performer for the San Francisco 49ers for seven years during which time the 49ers racked up six Western Division Championships and three World Champion titles. He joined the reigning Western Division Champion Los Angeles Raiders in 1990.